The leading online retailer of cheap tungsten carbide rings and wedding bands, EternalTungsten.com, has added significantly more styles of tungsten carbide wedding bands to their selection. EternalTungsten.com, the leading online retailer of affordable tungsten carbide rings and wedding bands has revamped their website by adding many more styles and they now offer laser engraving services. Eternal Tungsten strives to offer their customers the best value by offering extremely low priced tungsten carbide rings that have a lifetime warranty, which is unheard of in this industry. 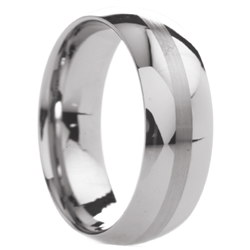 Eternal Tungsten has one of the largest selections of tungsten carbide wedding bands at unbelievable rock bottom prices. They have over 120 styles to choose from, which is more than just about all the biggest retailers whether you are talking about online or brick and mortar jewelry stores. Besides plain tungsten wedding bands, they also carry a large selection of black tungsten carbide rings, tungsten and carbon fiber rings, tungsten inlay rings and tungsten black ceramic rings. Many retailers claim their prices are so low because they cut out the middle man and buy direct from the factories. Well, Eternal Tungsten’s prices are so low because they own their own factory. They don’t need to buy anything from the factory, which cuts their costs even more and of course, this means they pass the savings on to you. Their rings also come with a lifetime warranty, which allows you to get a brand new ring for 50% of your original purchase price should you ever need to replace it due to finger size change or damage of any kind. Because they own their own factory, this means Eternal Tungsten has all the equipment needed to engrave their own rings. Many small independent jewelers do not have the money to buy their own laser engraving machines to engrave on tungsten rings. They have long delays when engraving your ring because they need to send it out to manufacturers to have it engraved. Eternal Tungsten doesn’t have this problem. They can engrave your ring the same day that you place your order and send it out. Plus, they have many more types of fonts to choose from, as well as, symbols. Their everyday low prices don’t go up and down like other retailers and you don’t need a special coupon code or shop during a special sale to get a great deal. Just like Costco or Walmart, you can buy any time and always get great savings, no gimmicks. EternalTungsten.com provides one of the largest selections of tungsten carbide rings and wedding bands at ridiculously low wholesale prices. They even offer engraving, which low end jewelry stores do not. They strive to provide the best customer service and the lowest prices on the best rings around to make your simple and fast.